I recently wrote an answer to this question by Tim Post. In my answer I advocated to change the way the Helper Queue works. To strengthen my argument there I decided to gather some data on how the Helper queue works. If a post is VLQ I open the link to it and raise an appropriate closure flag. I return to the review and click to raise the VLQ flag. I noticed that this shows the VLQ flags in my flagging history in this way, for some posts only however. For the posts where I flagged NAA the VLQ flag is raised one spot higher on the question. I can't find any logic however in why, in the other cases, sometimes the VLQ flag is in my flagging history, while in other cases it is not. The reason I'm gathering this data is to see if it is more helpful to use closure flags in the Helper queue instead of the VLQ flags redirecting the posts to triage, only to see them back in the helper queue only 10 minutes later. Apparently when I flag a post as off-topic for lacking an MCVE my VLQ flag is not shown in my flagging history. I'm not sure for othere flags though. 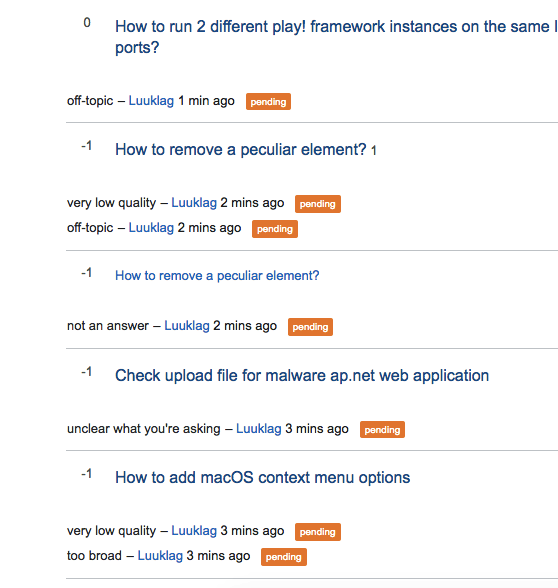 Browse other questions tagged discussion flags low-quality-posts help-improvement flag-history . Why when I flag a post in the review queue I can't see the flag in my flagging history?